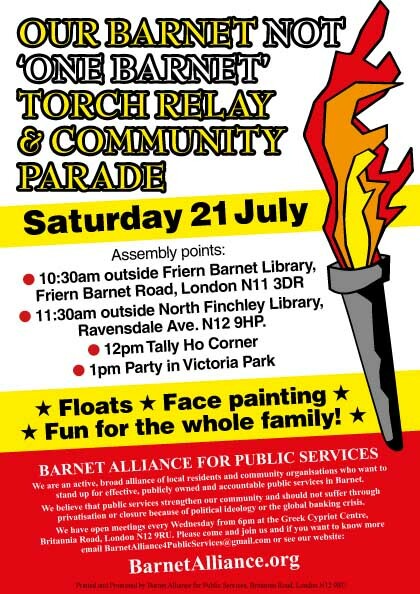 Citizen Barnet - trade union news and socialist propaganda from Barnet: Massive Olympics outsourcing scandal - and they still think One Barnet is a good idea? 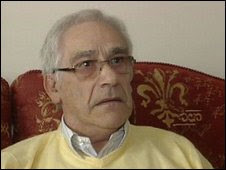 Massive Olympics outsourcing scandal - and they still think One Barnet is a good idea? On the G4S Olympics scandal, government minister Jeremy Hunt says: "It is completely normal that you are going to find some contractors on a project of this size who are not going to be able to deliver." Normal, please note! This is exactly why we don't want BT, Capita or EC Harris running our Barnet council services - and making off with £1bn of our money into the bargain! We cannot rely on them not to leave us in the lurch! Barnet is too big to fail, and One Barnet is too much of a risk! That is why Barnet Alliance for Public Services has organised this important event. 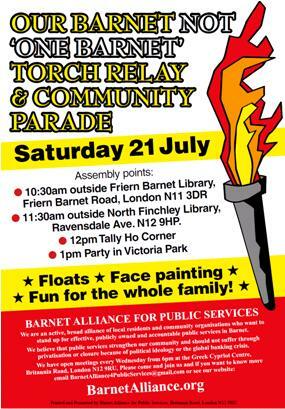 Join fellow Barnet residents this Saturday, 21 July, for the "Our Barnet, Not One Barnet!" torch relay and community parade. Help us say no to Barnet council's One Barnet privatisation programme. Bring friends, neighbours, colleagues, your organisations to this event. There will be transport provided for those who are not able to walk. Click here for the full version of the leaflet.